The walls of the Hosto Pii Hoci house in Sand Pillow are bright and lively thanks to volunteers from the Ho-Chunk community. 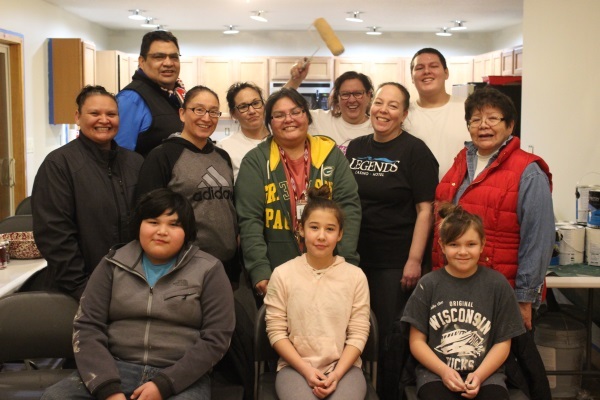 Volunteers ranging from 5 years of age to elite elder spent their evening Thursday, Jan. 11, painting the interior of a house that will serve as a safe positive, place for tribal members waiting for a vacancy at alcohol and substance abuse treatment facilities. According to Executive Director of Health Ona Garvin, a major obstacle facing individuals who are battling alcohol and substance abuse is their vulnerability to relapse. Those who have reached out and have expressed their sentiments to get clean have difficulties staying substance-free. A contributing factor to this impediment are the environments people experiencing alcohol/drug problems are exposed to. “It is important to have a building like this because if a person decides they want to go to detox, and they come to our health services and get assessed, then we say ‘we are going to find you a treatment place,’ they need to have a place to stay that is somewhere safe,” said Ona Garvin. “People will do the intake process and everything but, especially if somebody is homeless, they end up taking off to somewhere else – not fulfilling their obligations to go to treatment,” secretary of the Tribal Action Plan Henrietta Funmaker said. The Hosto Pii Hoci will be the first house of its kind owned and operated by the Ho-Chunk Nation. It will have rooms available for eight people who are waiting for treatment. The house will be staffed by trained facilitators and is expected to open its doors this coming spring. The Hosto Pii Hoci offers another avenue of support to by offering a safe and positive environment to persons in active addiction seeking remission.